In business for more than 35 years, LaBell Exchange has the experience and expertise necessary to deliver highly reliable call center services for Commerce businesses. We are a member of the nationwide Association of Teleservices International (ATSI) and have won their Award of Excellence seven years in a row for consistently providing exceptional phone answering with fast response times and reliable, accurate service. Accordingly, our clients can rest assured that they are always getting the best live-operator services available in Commerce. We answer calls 24 hours a day, often within three rings, and are able to customize our service with personalized greetings, business facts, voicemail trees, priority queues for emergencies, and more--all for a competitive rate. Call LaBell Exchange today to learn more about our call center services for Commerce companies. Call today to have LaBell Exchange help enhance your business' image, lower overhead costs, and increase profitability. 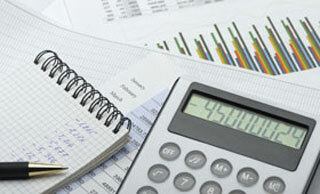 Save money in overhead expenses by outsourcing your receptionist needs to LaBell Exchange. Professional, courteous, and responsible, our virtual receptionists are rigorously screened and extensively trained to deliver exceptional customer service. Using pre-approved scripts, they will provide a personalized customer service experience and accurately handle your business's scheduling, reservation making, dispatching, ordering, credit card processing, complaint processing, survey taking, and call forwarding needs. Our call center operators are available 24 hours a day, and we staff bilingual operators who are proficient in both English and Spanish. We even offer third-party translation services. So call today learn more about how our virtual receptionists provide Commerce business with an unbeatable value. With over 39 years of experience, LaBell Exchange provides Commerce businesses with highly reliable dispatching services at a great price. Available at all hours of the day and night, our call center has the expertise necessary to provide callers with immediate response to both routine and emergency service calls. That's because our operators are all highly experienced and rigorously trained to work with everyone from EMTs to taxi cab companies. Call today and enhance your business in Commerce with 24-hour dispatching services. LaBell Exchange is committed to delivering unparalleled customer service for all of our phone answering services. We always prioritize the best interests of our customers and offer fully customized telephone answering services that are image-enhancing and cost-effective, offering commercial and industrial clients in Commerce a great return on their investment. As a family-owned company, we treat every client and caller with respect. 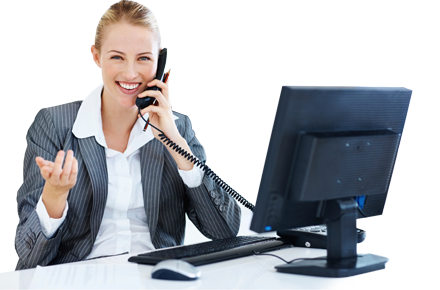 Accordingly, we hire and retain only dedicated call operators, all of whom are experienced at call screening, call forwarding, scheduling, message taking, order taking, purchasing, dispatching, and more. Courteous, patient, and reliable, they will ensure exceptional customer service so your business runs smoother. Call today to learn more. Increase the efficiency of your business in Commerce with professional information screening services by LaBell Exchange's call center. In business since 1975, we have helped thousands of commercial and industrial companies manage plaintiffs in class action lawsuits, process customer warranties, determine recall eligibility, screen prospective job applicants, and more. Accordingly, we have the experience and knowledge to set up and implement any Commerce business's information screening service as quickly and accurately as possible. We'll customize this service to include surveys, questionnaires, basic information, and pre-approved scripts or answers to commonly asked questions. Call today to learn about our competitive pricing options and month-to-month call center services with information screening for Commerce. Call LaBell Exchange today to learn how your business in Commerce can benefit from inbound telemarketing and call reporting services. Ideal for marketing campaigns, such as mass emails, flyers, billboard campaigns, and commercials, inbound telemarketing provides Commerce consumers with a live operator at all hours of the day or night. Through this service, you'll be able to meet the demands of your new customer base without overburdening existing staff or incurring additional overhead. And, because it's difficult to predict the call volume generated by various outreach efforts, we offer a number of phone answering options to keep costs low, such as scripted hold prompts, screening surveys, voicemail trees, message taking, and more--all of which will save you time and help you find the customers that best suit the services or products you offer. Upon request, we can also gather analytics, record phone calls, and measure the effectiveness of outreach efforts using our advanced telecommunications software. Outsource scheduling and reservation management by calling LaBell Exchange. Long recognized as one of the best call centers serving Commerce businesses, we have been trusted with a wide range of scheduling projects, from helping medical offices schedule appointments to managing RSVPs for financial and retirement planning seminars. We use only the latest Contact Management Center (CMC) software and are able to reliably manage client accounts, profiles, and projects with complete professionalism and confidentiality. Plus, all of our call center operators take the time to verify information received. Easily adapted to suit the specific needs of all types of businesses in Commerce, our scheduling and reservation management services are competitively priced and offered 24 hours a day. Call us today to learn more. When you choose LaBell Exchange to handle your phone survey needs in Commerce, you can be sure that we will treat all your callers with respect and accurately gather customer information. We use advanced software to manage all calls and create custom survey procedures for each of our clients. This service is ideal for any type of survey, including taking polls and collecting consumer data. Call today for a free consultation. Our phone survey services are available year-round, competitively priced, and offered with hassle-free, month-to-month service contracts. Simply tell us your survey needs in Commerce and we'll set you up with an account, an 800 or local phone number, voicemail service, and any other call center features you want to try out. Increase your profitability with 24-hour order and message taking. LaBell Exchange maintains a team of fully trained, courteous call center professionals who are able to handle large call volumes and provide customers with immediate assistance day or night. We use pre-approved scripts in order to speak knowledgeably about your company and are able to help businesses of all sizes, from large retail companies to sole proprietors, and from any industry. When your customers call in to your designated phone line, our experts can be trusted to accurately take their message or order. Additionally, our operators can process orders online or submit them to you in a form that we help you develop. Call today to explore the benefits of outsourcing your call center needs in Commerce. At LaBell Exchange, our voicemail service enhances a company's image by offering a level of professionalism that is usually associate with large, well-established businesses. Callers will speak with a live operator who is knowledgeable and professional, and be able to direct their call to an appropriate department or forward them to voicemail. We can send you immediate voicemail notifications via email, fax, or text, or send recorded wav files directly to your phone. And, if there are circumstances in which you want calls routed directly to an after-hours technician or other designee, we can do that too. And, because you're never locked into a long-term service plan, we can work with you month after month to find the voicemail plan that best suits your Commerce business. Call today. With advanced message delivery, our call center staff will keep you updated 24 hours a day, 7 days a week. Our call operators can immediately send message notifications via text, email, or fax; or, if you prefer, can call message recipients who, upon answering, will be prompted to enter a password to retrieve the message. 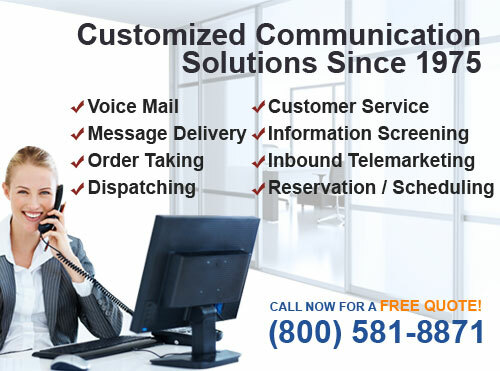 We use very dependable telecommunications technology and are able to store your voicemail preferences, from patching emergency calls to answering frequently asked questions to speaking intelligibly about your business and the services you offer. Either way, our live answering with advanced message delivery service offers Commerce businesses a convenient way to manage incoming phone calls with little overhead. Call to learn more.